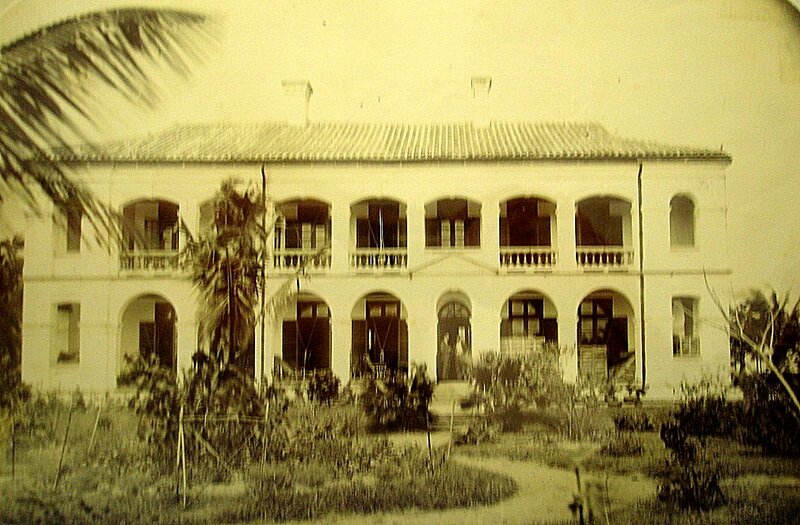 Kiungchow, near the north coast of Hainan Island, was designated a treaty port by the Treaty of Tientsin 1858. It transpired that the small port that served it, Hoihow, about three miles to its north, would make a less unpromising place to establish a consulate, and it was here that a vice-consulate opened in 1876, housed in a sequence of extremely unsuitable temporary premises on the Hoihow waterfront. A site on which to build, known as the Fort Egeria site, was rented in 1894 on Cocoa Nut Islet but access to it was so ill-maintained by the local authorities that it became useless. Seven lots of land were instead bought in 1897-8, just to the west of Hoi-How and south of Salt Pan Road, to form a site for a consul’s house. Designs were prepared by Cowan, the surveyor at Shanghai, and the foundation stone laid by the consul’s wife in November 1898. During construction, an adjacent site was acquired for constable’s quarters. 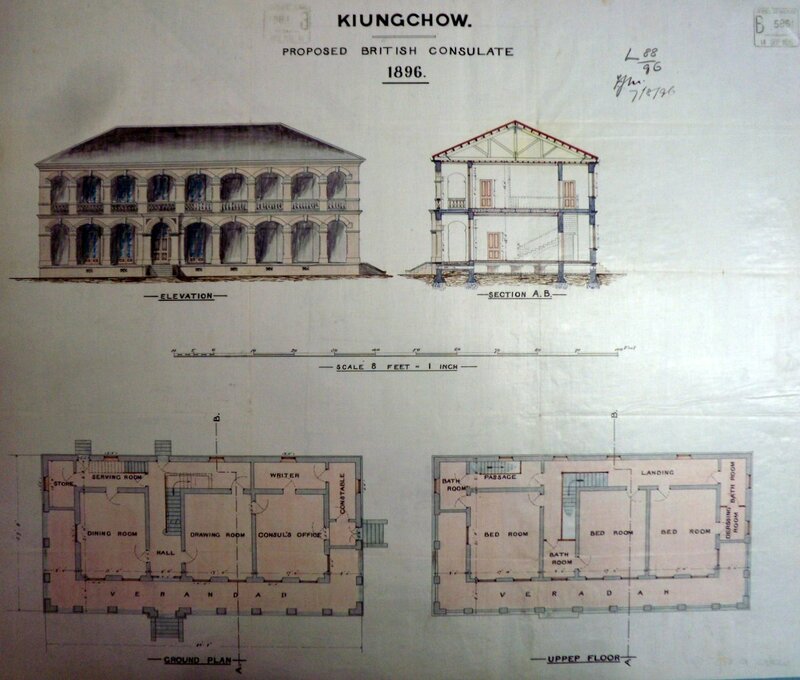 The consul’s residence, offices, constable’s quarters and lock-up were completed in 1900 for about £3,800. There was an exchange of land with a neighbour, the American Presbyterian Mission, in 1924 to re-arrange the access road. The post was closed in 1926 and the property let to the Asiatic Petroleum Company before the building was sold to the Chinese government, and the land returned to it, in 1929. 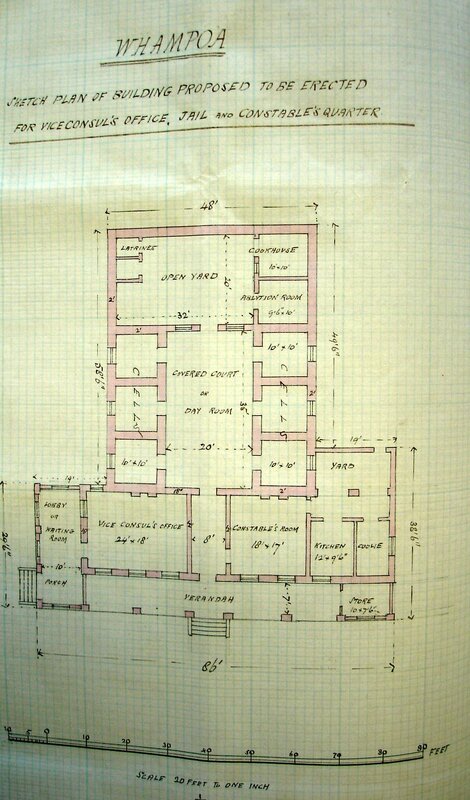 Cowan’s drawing for residence, 1896. The stone defensive barriers that the Chinese had built across the river during the First Opium War prevented large vessels sailing into Canton. They therefore anchored at Whampoa, about 12 miles downriver, and a vice-consulate was established there in 1843. It was first housed in a small boat and then an old navy store-ship, the Alligator. The consul moved onshore in 1865, and three years later into a new and spacious vice-consulate building designed by Crossman. The Post was closed in 1889 and the buildings sold to the Chinese Imperial Maritime Customs Department in 1891. Crossman’s sketch for office, constable’s quarter and gaol, 1867.